Most people think that if you want activewear that feels and performs well, you should look for a specific material. Unfortunately, it’s not that simple! One of the biggest lessons I’ve learned from trying out a huge amount of activewear is that there is huge variety in fabric quality, even when the tag looks similar. Each fabric producer may start with a similar fiber, but how they treat and process those fibers is ultimately what will make or break the quality of the end product. For example, I’ve worn polyester blends that are slick, thin, sheer, and scratchy. I’ve worn other polyester blends that feel lightweight and buttery, yet compressive and opaque. I’ve worn still other polyester blends that are thick, plush, cottony soft, and warm. Sure, the tag says “polyester” on all of them, but they could not be more different! Yes, the fabrication on the tag can be a starting point, but you should not base your decision off the tag alone. It’s not the whole story! If you can’t simply take a glance at the tag and make a decision, how do you know what to look for? The good news is, there’s something out there for everyone, you just have to know what to look for! Even though every person’s preferences and needs vary, this guide will arm you with the info you need to target your search. There are a few categories most active fabrics fall into. This isn’t quite an exhaustive list, but it will cover 99% of the activewear you’ll come across. 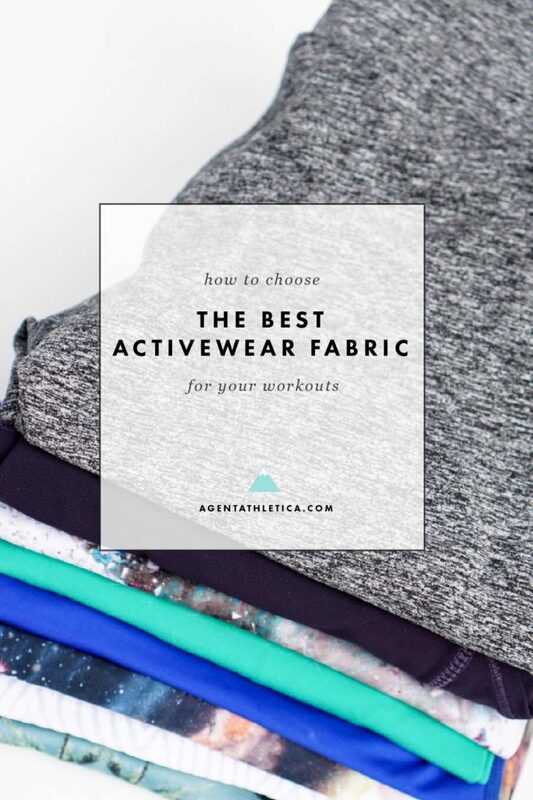 I’ll break down each type, including how to recognize each type of fabric and how to choose which one is best for your workouts. Fabrics with a soft, cotton-like feel are probably what you think of when you hear “yoga pants”. Most brands sell styles with this fabric, and most activewear lovers have something like this in their closet. This type of fabric is famous for being wonderfully comfortable while also having secret sweat-wicking, breathable powers. Cottony fabrics are usually (though not always) made of nylon and spandex fibers and are almost always the go-to choice for yoga-specific brands and styles. Another key word: supplex. Supplex is a type of nylon specifically engineered to feel soft and, well, supple. If you see supplex on the tag, it will definitely have a cottony feel. What are some downsides of this type of fabric? Cottony fabrics tend to gather fuzz, lint, and pet hair. As these fabrics age through continual washing and wearing, they tend to get even more “sticky”, attracting even more little fuzzies. Soft fabrics are also the most prone to pilling, meaning the fabric tends to eventually ball up and feel rough. Pilling tends to show up between the thighs or anywhere else that might be exposed to continuous rubbing (e.g., on your side where you carry your purse). Note: these characteristics basically only apply to solid or heathered fabrics. A lot of times, brands that use cottony soft fabrics will also make prints. Prints do not have the same cottony feel as their solid or heathered cousins, even though they’re often sold under the same name. Instead, prints usually fall into the “slick fabrics” bucket below. Slick fabrics are the other most common type of athletic fabric. Instead of feeling soft and natural, these have a smooth face and a lightweight, cool feel. For example, you’ll find this fabric commonly used for running tights. Fabric of this kind made by high-end brands will often feel slightly smoother, almost like silk. Many slick fabrics have a slightly shiny look about them, as opposed to the more matte look of a cottony fabric. A big advantage of slick fabrics is that it resists pilling. It’s not completely pill-proof, but you can put this type of material through a lot more abuse and it tends to maintain its slick, smooth face. The material also tends to feel more cool against the skin and breathes better than cottony fabrics. That makes these slick fabrics better for higher-performance, higher-sweat activities. It also does not attract lint and pet hair–usually fuzzies just brush right off. Slick fabrics are particularly good for sports bras. Cottony fabrics sometimes feel hot and stifling. Personally, even if I’m doing a pretty low-intensity workout, I almost always look for sports bras that have a smooth, cool feel. Sports bras with slick material also tend to be a little better at holding things in compared to cottony fabrics. Depending on the brand and their specific process, sometimes slick fabrics can be prone to snags. These first two fabrics probably sums up 75% of all the activewear out there. But, a few others out there don’t quite fit into either category. Let’s talk about those, too. For high impact, high intensity workouts, compression just might be your best friend. With a firm, compressive fit, you feel locked down and streamlined. When fit properly, compression fabrics will feel firmer and tighter than non-compressive clothing, but still shouldn’t pinch or cut in anywhere. Compression fabrics have the same slick face as above, but they are more specialized for high-performance activities. The major downside of compression is some fabrications can feel stiff and inflexible. Some brands have mastered the art of making materials both compressive and flexible, but that’s not true of all of them. You might feel a little too locked down, to the point where you can’t move as comfortably as you can in other fabrics. You may be able to solve this issue by sizing up if you’re looking for a more gentle fit. Styles that offer a compressive fit usually say as much on the tag or product description. But be aware: not all compression is created equal. Some brands may say their fabric is compressive, but it may just be average. Fabrics that use elastane instead of spandex often have superior compression, but as I said above, the tag is just a clue, not the complete story. Many spandex blends can still be quite compressive. Thermal fabrics provide maximum warmth in cold-weather conditions. The thick fabric holds in warmth, but is still breathable and sweat-wicking. They feel thicker and softer than other high-performance fabrics, although they are made with higher-intensity outdoor workouts in mind. Some are prone to pilling because of the soft finish. Besides the word “thermal”, cold weather styles also sometimes include the keywords “brushed” (though occasionally this can be used to describe non-thermal styles), and of course “fleece”. Brands and styles that use this type of fabric: currently out of season. Lululemon’s best two thermal fabrics are rulu and tech fleece, which usually start showing up around September. Sweaty Betty also makes good thermal styles. Textured fabrics look like prints, but they go a step further. Instead of just dyeing a pattern onto fabric, textures actually have the pattern woven into the fabric. Some textures are flat, like herringbone, while others actually have a three-dimensional structure. Textures tend to be a bit thicker than your standard activewear, especially if they have 3D patterning. Textures add a really unique element to your workout wardrobe, and happen to be one of my personal favorites. The super-soft, lightweight, breezy feel makes natural fabrics well-loved by many. The major downside of natural fabrics is that they tend to have less-than-excellent sweat-wicking properties and take a long time to dry. In other words, wearing natural fabrics can mean getting very sweaty and staying that way. Also: natural fabrics are very prone to pilling. Despite the fact that they are pretty decidedly not high-performance fabrics, natural fabrics (especially tops) have been gaining in popularity among activewear lovers. If you’re looking at natural fabrics, I suggest looking for loose-fitting tops. This will allow air to flow and cool you so that your top does not get soggy and stifling. I personally don’t recommend natural fibers for leggings/bottoms. One exception to this is merino. Wool actually has good natural sweat-wicking properties. That said, most wools are quite warm and are more like a thermal fabric. Another exception is bamboo: bamboo fibers can also be produced in a way that promotes moisture-wicking properties. Seamless tops are great for all-purpose activities, including high-intensity workouts. On the flipside, seamless bottoms and bras work best for specialized activities. The fabric is usually quite delicate, and tends to be prone to sheerness, snags, and pilling. For example, going for a run in seamless yoga bottoms can sometimes destroy them in just one go. On the plus side, seamless fabric is incredibly comfortable, lightweight, and soft. It’s also usually quite stretchy. Styles made of seamless material often look very small on the hanger, but don’t be alarmed, they stretch out more than you think they will. Wish you would highlight shorts more often! I know its all about the leggings these days but shorts are my staple for my workouts! I only wear leggings while teaching or taking yoga classes. I completely agree!! I get too hot in leggings! Fun summary! I have been loving your articles lately! P.S. Do we think L’urv’s new “Spot Me” print is sheer??? hmmm…. This is all very good information and thank you for posting it. But also, I didn’t realize those Alala Chill Tights were still available – for $45. I’m not sure I can resist them any longer! (Here’s hoping the size I chose works – final sale, gah). oooh I want to order those…. how do they run? I’m a size 4 in LLL. Note: these ran small for me the first time I tried them on. I’m normally a medium (or a small 8 in lulu) but the M in these was way too tight, so I’m crossing my fingers on a large. I’d advise going at least a size up. I wear a size 2 in lulu and I have them in a size S. I originally ordered the XS but they were too small. I think the S will work for a 4 as well. Also: the solid black chill tights run true (I have those in my usual XS), it’s just the pique that I linked in this post that run small. Great post! I have to say that I almost never wear the cottony feel (Luon in LLL terms) bottoms for workouts. The rare exception is the Aligns for yoga. All my crossfit and running is definitely in slicker (Luxtreme!) type fabric. I am LOVING Carbon 38’s house brand capris… the Sprint Compression Crop. The fabric is cool and slick, but they are also 100% opaque. They have compression and pull everything in, but the fabric is still super flexible. No pinching at the knees! I bought them around this time last year, and I reach for them more than just about any other capri legging. (and i have DRAWERS full of Lulu!) I am a size 4 in LLL leggings, and the XS fits comfortably. Same–I have really pulled away from luon and other cottony fabrics in the past couple of years. Admittedly, that’s at least in part due to the crippling amount of dog hair in my house, haha. For yoga, I like the “hybrid” fabrics I’ve found that are slicker than luon but softer than lux, like the Koral mystic capris. It’s too bad Carbon38 doesn’t make an XXS in the sprint crops. They sound awesome! I know you have Lululemon Swiftly listed in the last category but they are probably one of the best sweat wicking, cooler lightweight running tops and tanks i’ve ever worn. I use these for 15-20 milers in 80 degree + temps on a regular basis and other than going shirtless or using something like the lightened up/fast lane singlets they are the best for this type of mileage and heat. I own way too many (embarrassed to even state here) and I haven’t had any issues with them snagging, pilling or anything. Even with my running hydration pack I use. Love your deep dive articles like this! Warpstreme is not usually used in lululemon’s women’s styles, so I don’t know the fabric composition. That said, composition can vary for different styles of the same fabric, so all warpstreme may not be the same.